Japan has some of the best food in the world, hands down. If you plan on taking a trip there, you’ll be amazed at how many food shops and restaurants there are. With so many options, it’s hard to find true Japanese foods that are delicious, cheap, and can be found anywhere you go. These are the top 21 foods that you’ll find in virtually every big city in Japan. Some are very traditional foods, while others are quite modern. But they are all foods that local Japanese people eat and love. Try and see if you can eat them all! I bet you thought that ramen and sushi would be at the top of this list. Make no mistake, sushi and ramen are amazing Japanese foods, but for something a little less traditional, be sure to check out a Japanese bakery. You won’t have any trouble finding a bakery, because they are all over Japan. There are probably dozens of different bakeries in any given city. Even rural areas have local bakeries. In big cities like Tokyo or Osaka, you can find bakeries near or even in the train station. These bakeries have traditional Japanese sweets such as manju and anpan (red bean paste filled sweets), french bread, and even unique creations like Melon Bread (メロンパン-meron pan in Japanese). These round pastries pictured above have a slightly crunchy and sugary top, and a soft chewy center. While the name implies it would taste like melon, it does not. It is a perfect sweet snack when you want to grab a bit to eat on the go. If you love good bread, head to Kobe in Hyogo prefecture. The bakeries have some of the best breads in the world. If you have never tried unagi before, you are missing out. While eating eel may turn some people off, definitely give it a try before while you are in Japan. Eel is a seafood, but doesn’t have a very strong “sea” taste. When prepared kabayaki style (broiled with a sweet soy sauce ), it taste more like beef than fish. It has a very nice fattiness which perfectly balances the sweet soy sauce and rice. While this can be eaten all year around, it is particularly popular in the summer. Shizuoka prefecture is known for their delicious unagi kabayaki. This sweet is the ultimate when it comes to delicious, balanced sweets. “Ichigo” means strawberry, and “daifuku” literally means great luck. This wonderful dessert is a sweet, but slightly tangy Japanese strawberry covered in red bean paste. This is all wrapped in soft mochi (rice cake). With each bite, you get a sugary sweetness from the red bean paste, a tart and refreshing punch from the strawberry, and the soft mochi to add an amazing texture. You may have to keep your eyes open to find this in Japan. It is sold in many, many places, but because it has a short shelf life (probably can last for a few days if kept cool, but most stores take it off the shelves after one day or less), stores don’t carry a huge inventory of it. Convenience stores (found ALL OVER in Japan) sometimes carry them, as well as supermarkets. You’ll might also see small shops specializing in Japanese sweets that sell ichigo daifuku. Definitely give it a try! Karaage is Japanese fried chicken. Small pieces of boneless thigh or breast meat is marinaded is a combination of soy sauce, sugar, garlic, ginger, sake, and other flavors. The flavored chicken is then breaded in potato starch and deep fried. While very simple, it is one of the best versions of fried chicken you’ll find anywhere in the world. Each piece has a perfect ratio of skin to meat, and is amazingly juicy. The outside is hot and crunchy, and is perfectly season with the marinade. This dish can be found in many restaurants, all over Japan. It is a common menu item at quick teishoku (Japanese set meals) restaurants, izakayas (Japanese bar/pub), convenience stores, and even small shops which sell nothing but karaage. Japanese curry and rice is a meal that is both tasty and satisfying. But why not take it to another level and add a juicy piece of tonkatsu (pork cutlet) or chicken katsu (chicken cutlet) to it? The crispy and meaty katsu makes every bite of curry more wonderful. There are many places to get katsu curry. Most of them are cheap too. A popular curry restaurant chain in Japan is CoCo Ichiban. They are located all over Japan (and even in other parts of the world). But you’ll also find many small mom and pop shops that serve katsu curry as well. 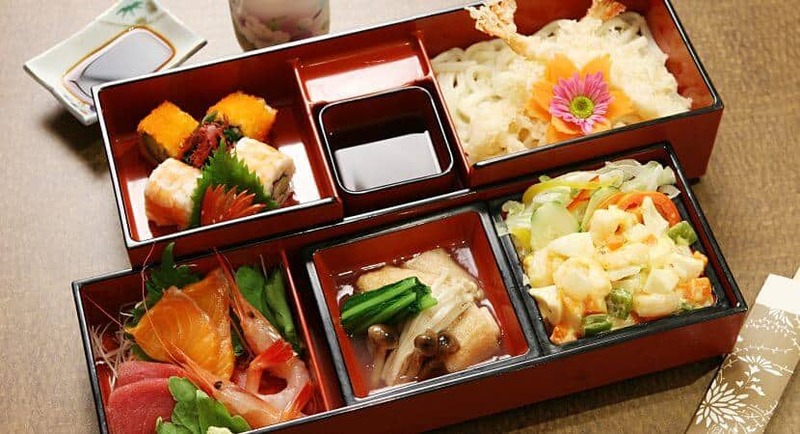 If you want to eat what the locals eat, then be sure to pick up a bento. You can find these boxed meals everywhere. They sell them in supermarkets, convenience stores, food shops, in the basement of department stores, food stalls….pretty much everywhere. There are tons of different bento you can choose from. You can choose a bento that has fish, croquette, egg, shumai, and vegetables like the one pictured above. Or you may want something heartier and go with a fried chicken bento. Or how about a hamburger steak bento? The list goes on and one. They also sell bento at many of the bullet train stations (usually high quality than supermarkets, but more expensive). These bento, called “Ekiben,” (literally, train station bento) are the perfect way to enjoy a meal while riding on the bullet train. You’ve probably heard of a $100 Japanese melon or thousand dollar grapes right? While I have no doubt that they must taste delicious, most of us don’t (or won’t) want to pay hundreds of dollars for a piece of fruit. The good news is that you don’t. Some of the normal priced fruit in supermarkets are still awesome. If you go in the winter, be sure to try mikan (Mandarin Orange) or grapes and peaches in the summer. If you stay at a ryokan (traditional Japanese inn), you can usually choose if you want to purchase a meal or not. Many of the nicer ryokan uses some of the best fruit Japan has to offer as a dessert course for their meals. Many fine dining traditional Japanese restaurants also use amazing Japanese fruits in their meals as well. Do you honestly think we could have left sushi out of this list? Of course not! Fresh ingredients prepared by some of the best sushi chefs in the world is hard to beat. Even kaiten zushi (conveyor belt sushi) restaurants are great. Kaiten sushi restaurants use machines to form the rice, but it still is delicious…and cheap! There are many places that offer 100 yen plates of sushi. Not only does Japan has some of the best seafood in the world, but their knowledge and skill of preparing it makes sushi a must try while in Japan. Kobe beef. The holy grail of beef. It is expensive, but worth every penny. I mean, just look at all of that marbling! These specially raised cattle produce meat with fat that literally melts if you touch it. What does this mean? It also melts in your mouth. The smooth and flavorful marbling makes this the king of all steaks. Yet, the texture and taste is so different, it is nothing like normal beef steaks you find in other parts of the world. If you live in other parts of the world, especially the USA, it is almost next to impossible to get real Kobe beef. Only scarce amounts are exported to the USA and to a few other select countries. Many restaurants label their menu items with the name “Kobe beef,” but the truth is that it isn’t the real thing. That’s right. Those Kobe beef burgers you’ve been eating? Definitely NOT real Kobe beef. You also can’t order real Kobe beef. You need to go to places where it’s exported, like Macao or Hong Kong, but why not get it from the source? But even in Japan, there are many places claiming to serve Kobe beef. These places DO serve Kobe beef and are cheap, but it’s not what you should be looking for. If you’re going to try Kobe beef, you need to make sure to try the rigth GRADE of Kobe beef. Go with an A4 or A5 grade. Most legit Kobe beef restaurants like Moriya in Kobe have it. Try it. You won’t regret it. Check out the video to see how the cook Kobe beef in Japan! Vanilla. Chocolate. Matcha green tea. Strawberry. Even wasabi. These are just a small sampling of soft cream, or soft serve ice cream flavors you can find all over Japan. If you have a sweet tooth, soft cream is a must. Its creamy and smooth, and bursting with flavor. If you think you had real matcha green tea ice cream before, think again. Matcha green tea soft cream in Japan is at another level. Each region in Japan has special flavors of soft cream. You can find flavors like grape, sweet potato, pumpkin, and even onion. Of course, no list about food in Japan would be complete without ramen. There are many different types of broths used in ramen in Japan. The most common ones are tonkotsu (super rich and flavorful broth made from pork bones), shoyu (soy sauce base), shio (a clear to slight yellowish broth in which the main seasoning is salt), miso (fermented bean paste), and torigara (chicken). The noodles are Chinese style noodles which come it many shapes and thicknesses. You NEED to try ramen while you are in Japan. Not only is the broth and noodles delicious, but the toppings that come with ramen is awesome too. Common toppings are char siu, fish cakes, and vegetables. The good news is that you can pretty much find a ramen shop anywhere you go in Japan. If you don’t mind thicker and rich broths, go with the tonkotsu ramen. Two famous chain restaurants in Japan for tonkotsu ramen are Ippudo and Ichiran. If you want something lighter, try the shio or shoyu ramen. Japan has taken the art of battering and frying food to another level with tempura. If you try tempura in other parts of the world (and even in Japan), the batter is usually thick, which can be delicious at times. However, if you go to a restaurant that specializes in tempura, or a nicer Japanese restaurant that has it on their menu, you’ll be treated to amazing fried pieces of seafood and vegetables. These professional tempura chefs are able to make the batter so light, you can see right through it. While it looks like there isn’t much batter one it, one bite and you’ll realize how perfect it is. The thin, yet ultra crispy batter lets the food shine through, instead of getting huge pieces of batter with each bite. The tsuyu, or tempura sauce, is also very important. At a tempura restaurant, you’ll get a sauce made with amazing ingredients like dried bonito flakes and special soy sauce. No bottled stuff at these high class places. While many people think of Korean food when they hear yakiniku, it is still a must try when you are in Japan. There are many good yakiniku restaurants in Korea, but the general consensus between yakiniku lovers is that when it comes to beef, Japan yakiniku reigns supreme. However, if you are into horumon (offal) then Korea is the place to be. There are tons of different yakiniku restaurants all over Japan. Some of them are really cheap, and some spare no expense and use the finest Kobe beef (see #9 on this list). The amazing thing about Japan is that many of these yakiniku restaurants offer a “tabehoudai,” which means “all you can eat.” So you pay a set price and you can eat as much yakiniku as you can within a certain time limit (usually 90-120 minutes). Some of these restaurants also offer a “nomihoudai,” which means “all you can drink.” That’s right folks, you can eat all the yakiniku you want AND drink all the alcohol that you want…usually for around $50 bucks or less. If that doesn’t temp you, I don’t know what would! These cute like red bean-filled pastries are shaped like little fish. You’ll see little shops selling these on the street, or even in the gourmet section of big department stores. The dough is sweet and light, yet has a very pleasant chewiness. The traditional taiyaki are filled with sweet red beans, but modern versions are filled with cream, custard, cheese, chocolate, or sweet potato. The are usually cheap, and taste great when its fresh off the grill. There are many crepe shops all throughout Japan. And this is with good reason. Japan sure knows how to make a fabulous crepe! There are many different flavors to choose from. You can add things like fresh fruit, ice cream, custard, pudding, and even savory items like tuna and sausages. Check out the video below to see how delicious crepes in Japan are! Yakitori, or grilled chicken, is so simple, but somehow tastes way better than if you tried to grill chicken yourself at home. What’s the secret? Besides using quality ingredients, legit yakitori restaurants use charcoal to grill their meats. Each section of their grill has a different amount of charcoal in it, which means each section is a different temperature. It takes skill and fireproof hands to cook each piece of chicken to perfection. The two main flavors for yakitori are shio (salt) and tare (sauce). Try the shio if you like the natural taste of chicken. If you want something a little more sweet, the sweet soy sauce glaze is right up your alley. While there are many parts of the chicken you can order (yes, there are more parts served in Japan that just breasts, thighs, and wings), we recommend you try chicken hip. So juicy and crispy it will leave you wondering why other places in the world don’t have chicken hips. Indian cuisine? In Japan? Shouldn’t you go to India for that? Well, that might be true, but the Indian food in Japan is so good and authentic, it is worth eating while you are in Japan. There are many Indian cuisine restaurants in Japan, and they are awesome. Not eating Japanese food while visiting Japan seems like kind of a waste, but once you taste some delicious nan, tandoori chicken, and curry, you’ll quickly change your mind. Many Indian cuisine restaurants in Japan can be quite pricey for dinner, but offer very reasonable lunch sets. If you want to try something different or need a break from Japanese food, be sure to check out one of the many Indian restaurants in Japan. Omurice is literally translated to “omelette and rice.” This dish influenced by western-style cuisine is essentially a friend rice dish covered with an omelette. There are many different flavor combinations of omurice. The standard version is made with friend rice seasoned with ketchup, topped with an omelette, and using more ketchup on the top as a sauce. However, recent various include risotto filled omelettes, demi-glace, beef stew, curry, and even cream stew. There are specialty restaurants that just serve omurice, or many western-style cuisine restaurants have it on their menus as well. Of course the you can get your fresh seafood fix by eating sushi, but there are other dishes that you need to try while in Japan. One of them is crab. If you have ever seen that huge moving crab sign in Osaka, that is a chain restaurant called “Kani Doraku.” This is just one of the restaurants you can go to try sample crab cooked in many different ways. You can try it raw, grilled, steamed, and cooked as tempura. Another seafood that isn’t really a sushi item is oysters. Oysters are a specialty of Miyajima Island in Hiroshima prefecture. If you go there, you can see many vendors grilling fresh oysters. They are amazing. Or you can get a popular dish called “kaki furai,” which translates to “fried oysters.” These oysters are coated with panko bread crumbs and deep fried. It is usually served with tartar sauce. These fried oysters can be found in bento (#6 on this list) at supermarkets, convenience stores, and in the gourmet section of department stores in winter. These pork and vegetable filled Chinese dumplings are a perfect compliment to eat with ramen (#11 on this list), or are great by themselves. If you think you had good gyoza, think again. The filling is so juicy that when you bite into it, juices flow out of it. The wrapper is thin, but also soft and chewy, which gives it an amazing texture. You can find these anywhere, even in convenience stores, but the Chinatown area in Yokohama or Kobe is a safe bet. But many izakayas, Chinese and ramen restaurants have gyoza as well. There are so many green tea desserts in Japan. Matcha green tea cakes, cream puffs, chocolate, soft serve ice cream, cakes…you name it, they probably have it. However, if you go to a good bakery or restaurant that serves green tea desserts, you’ll find that the matcha flavor in Japan is much richer and stronger, and perfectly balanced with the sweet dessert. If you’re a fan of matcha green tea, you need to try at least one good dessert in Japan! While there are many regions in Japan that have good matcha green tea, the city of Uji in Kyoto is famous for their wonderful tea. The matcha produce in Uji is known to be rich and deep in flavor, which is why it is used in many desserts in Japan. As you may know, there are matcha green tea flavored Kit-Kats from Japan. Most of these green tea flavored Kit-Kats use Uji matcha. Try it out! Are there any foods you love from Japan that we missed? Be sure to let us know in the comments below! Love the list! I’m going to Japan next month. Will make a point to try all, especially the desserts!